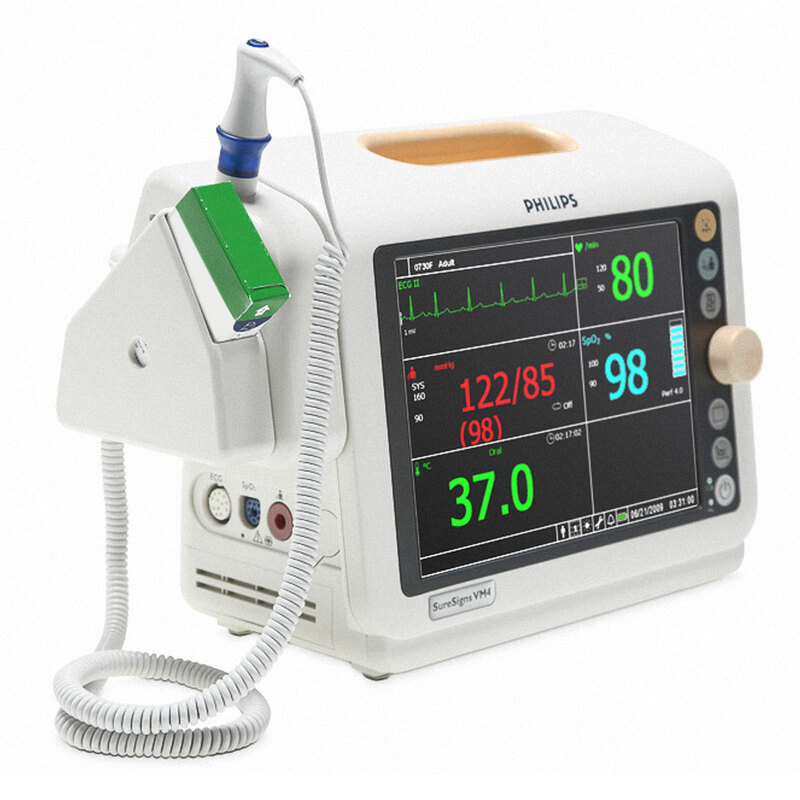 Philips SureSigns VM4 Vital Signs Patient Monitor. Standalone bedside patient monitor that is easy to learn and easy to use. Flexible, compact, and lightweight, the VM4 is ideal for spot check and continuous monitoring multiple vitals for adults, pediatrics, and neonates. The VM4 features an easy-to-read display with large color-coded numerics and up to 3 waveforms (for ECG, SpO2 & respiration). The VM4 patient monitor has been designed to be ideal for spot check and continuous monitoring modes. For ease of downloading data, the VM4 features LAN/serial data export in HL7 format. There is also a USB port for data export and software upgrades. It has a lithium-ion battery as an internal power supply, and an AC power cord for operation and charging. Battery operating time is 6 hours with continuous SpO2, charges in less than 4 hours. The VM4 ships with the ECG, SpO2 & NBP packages onboard, a power cord, lithium-ion battery, instructions for use, quick reference cards, service manual on CD, and a 3-year parts only warranty. Basic accessories package includes the SpO2 Sensor Starter Pack (M1131-64001), single patient use: 2 adult/pediatric single patient clip sensors, 2 infant single patient wrap sensors, 2 neonate/infant/adult single patient wrap sensors, adapter cable; 3-lead ECG lead set with grabber cable; adult antimicrobial NBP cuff, and interconnect tubing. Also available are an optional add-on recorder/printer, and an optional add-on temperature package (predictive oral/axillary). Recorder/printer includes 2 rolls of recorder paper (989803136891). Temperature module includes temperature probe covers.